I am providing images to follow, for the under 10k rep users in case the question itself becomes deleted. 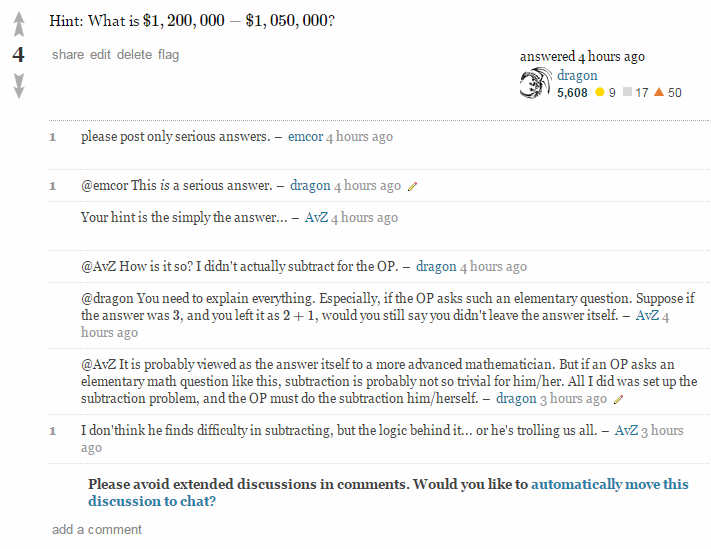 Granted, the OP's question (see below image) is a basic subtraction problem. I'm all for helping out as much as I can, even with questions as elementary as this one. However, I am disturbed by the responses that follow my answer (see above image; e.g. "Please post only serious answers"), as well as some responses that follow the question as well. Unsurprisingly, the OP did not take this well. After all, I too found that some of these comments were mean-spirited in nature. Furthermore, is it "wrong" to answer elementary level questions? I gave a hint (not an answer, as some users will unfortunately debate), and accordingly I received some backlash as well in the comments to follow my answer. Needless to say, I am a little angry at this moment, as of writing up this post. So I apologize if my tone here is off-putting. I think your answer is fine - setting up the subtraction could certainly be sufficient to help someone with this problem, especially since it should be fairly clear to them where those numbers are coming from. It's clearly a serious answer. However, AvZ does raise a valid objection - but I'd read that more as a stylistic thing (best resolved by AvZ writing their own answer) than a "This answer is bad" sort of thing. Your answer is valid, though it's very short in a way some people might not like. How much more money is needed to get to 1.2 million if you have one million fifty thousand dollars? I can see that if you need 3 dollars and have 2 dollars then you need 3-2=1 dollar, but I'm having trouble writing out the numbers in my problem. would be a good question. Their question was not and was rightly closed. I do, however, feel that all the comments below the post are non-constructive - "What have you tried?" is a pretty lazy way to ask someone for context when it seems fairly clear that they're not going to have an answer to that. A comment like "If you wanted 10 dollars and had 7, how would you figure out how much more you needed?" would be quite helpful (to discern if the problem is in setting things up, or not knowing the general method - or what) - and I'm sure other users could think of many other constructive comments to leave on such a post. Arithmetic is perfectly on topic here, subject to the same requirements other questions are. This site's customs for addressing questions lacking context is often more harsh than helpful, especially towards elementary questions. It is not necessarily "wrong" to answer a question like this one, but it's probably not effort well-spent unless you can read the OP's mind. Not the answer you're looking for? Browse other questions tagged discussion comment . How not knowing anything about a subject, does one ask better questions? Can a question be too easy? 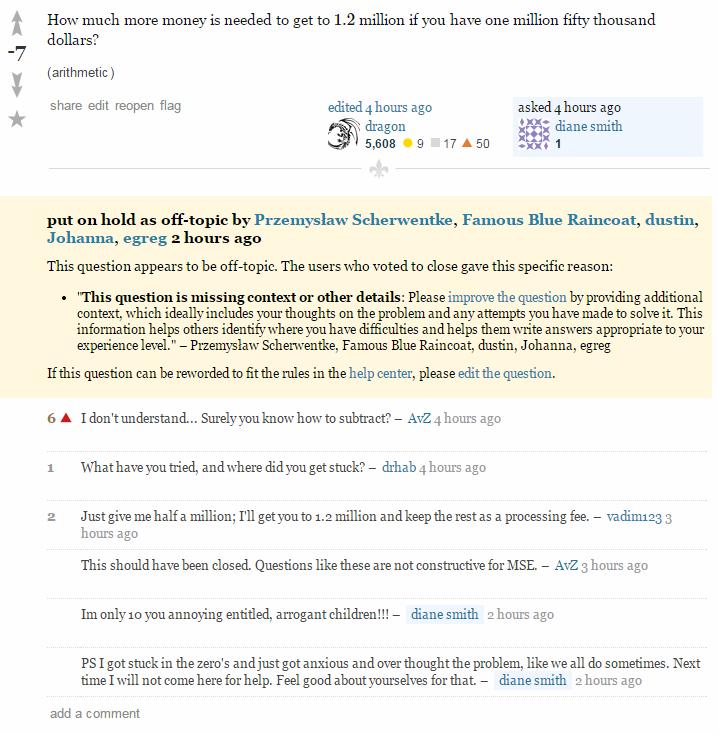 Answering a question via comments: good or bad practice?